THE CLASSIC MARVEL TEAM-UP RETURNS! • After a science demonstration at Empire State University goes awry, Ms. Marvel and Spider-Man find themselves tangled up in the same chaotic adventure. Is it destiny? Or disaster?! 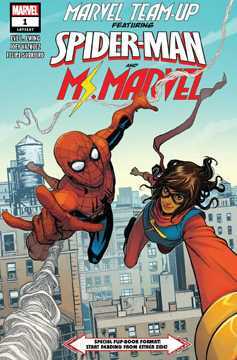 • Eve L. Ewing (IRONHEART) and Joey Vazquez (SPIDER-GEDDON) team up for the first thrilling arc of a mind-bending and magnificent new series! Rated T+.